Whitten's MMO class had their Thanksgiving Feast on Wednesday. It was so much fun and the kids played more than they ate!! Whitten's teacher, Mrs. Jamie, made her whole class turkey t-shirts for the occasion. I thought they turned out so cute!! While Mary Katharine and I were in Madison, we had to stop by one of my oldest and dearest friends homes to welcome her new baby girl, Harper Grace Tackett!! Rebecca and I have been best friends since 1st grade and our children are all close in age. It was so fun to see them all and hard to imagine how fast they grow up...MK is just a 13 weeks older and she looks so much bigger!! Time flies!! When Vaiden and Whitten were both babies, I had their hand and feet prints made into a mold. Sweet Dreams in Madison has a lady from Memphis come a couple of times a year to do these. I was so happy to make the trip to Madison to have her do the same thing for Mary Katharine. Now, all 3 of my children have one piece with both their baby hand and foot and another piece that is just their baby foot that is an ornament. Here are a couple of pictures of her making her mark!! Can't wait to see the finished products!! Since I have been nursing Mary Katharine, no one has had a chance to feed her. Vaiden has been begging me to let him give her a bottle. Well, on Monday night, I had a meeting to go to and Michael was at home with all the kids. Vaiden once again begged to feed Mary Katharine. Michael said that Vaiden did a great job and Mary Katharine just stared at Vaiden the entire time. I am so happy that my sweet husband knew to grab my camera and take this priceless picture!! Vaiden truly is one proud big brother!! And if you know, Whitten at all, you know that he wants to do EVERYTHING Vaiden does!! So the next night, I had to make sure I let Whitten have a turn feeding his sister!! He also is one proud brother!! Ole Miss played the University of Louisiana Lafayette for their Homecoming Game this year. It was a cold weekend, so my sweet mother in-law stayed at home with Mary Katharine. Michael and I got the boys out and enjoyed a great day in the Grove. Michael played football for the University of Louisiana Lafayette in 1997 (then they were called Southwest Louisiana, i.e....the hat Michael is wearing), so this game was a real treat for us!! Vaiden wore one of Michael's football jerseys and he was a proud little man!! All day the boys were chanting...Hotty Toddy Rajun Cajuns!! We were pulling for both teams!! The band is our favorite part!! Whitten and his buddy, Anderson, behind the fence!! 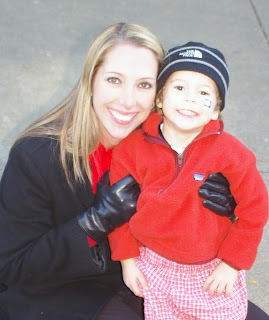 Mary Katharine all bundled up...never knew she was at the parade...ha!! Ole Miss played the University of Louisiana Lafayette for their Homecoming game a couple of weekends ago. We took the kids out for the Homecoming parade. It was cold, but we had a great time!! Hotty Toddy!! I was cleaning up all my Halloween things the other day and Whitten was getting into it all!! He wanted to play in all the past Halloween costumes. It really was funny seeing him. The sad thing was that they all fit him...Ha!! Mary Katharine as Princess Baby Peach!! When my boys said they wanted to be Mario Brothers for Halloween, I wasn't really excited!! I guess it was the huge mustaches that they would be wearing that was thowing me off!! I really didn't have any particular costume in mind for them to wear, but I was just hoping for something else and I really wanted the 3 of them to be a group/match. Well, the Mario and Luigi idea never changed, so I accepted it and moved on. A friend of mine made Mary Katharine's Princess Peach costume and I found the crown at Target...it was part of a dog's costume..ha ha!! I thought my three were really cute on Halloween!! As Whitten...aka, Mario...said all night "Yahoo"!! The neighborhood next to ours had a Halloween party this year. It was so much fun with a ton of cute kids dressed up. The food was fun because it was Halloween inspired!! We had a great Halloween and the kids got a ton of candy!! The cupcakes that Vaiden, Michael, and I made...I thought they turned out really cute!! We will always be the Ole Miss Colonel Rebels!!!!!! Whitten's MMO class had their Fall Party last week. It was so much fun!! Their teacher made the t-shirts that they are all wearing and they all looked so cute matching!! Happy Fall Y'all! !